Technical towel for active lifestyle and travel. Ideal for both beach and bath use. Dimensions: Unfolded: 34" x 58"; Folded: 4" x 6"
Everything the ad says about this towel is true. It does reject sand, it folds up very small, it’s very light weight, dries more quickly than other towels, and it truly does get softer the more you use it and wash it. Love my new Towels! So Soft Dries your skin as soon as you touch them! And the towel dries off so quickly I Recommend Them!!!!! A traditional plush towel may look luxurious, but one trip to the beach or gym with a BareSkin and you’ll be rethinking your definition of a great towel. The creator is Marni Montreal, who wanted a lightweight towel that would dry quickly and would shed sand rather than trapping it. Terrycloth was out. Traditional chamois was compact and didn't hold sand, but it dried stiff and sometimes smelly. After experimenting with a number of microfiber and sponge towels, she came up with BareSkin. Like chamois, this synthetic can hold up to three times its own weight in moisture, and it continues to work even when damp. BareSkin towels stay soft—and get softer with each washing—and are naturally anti-microbial. They also pack up tiny and dry 2-3 times more quickly than other towels, which cuts down on dryer use. 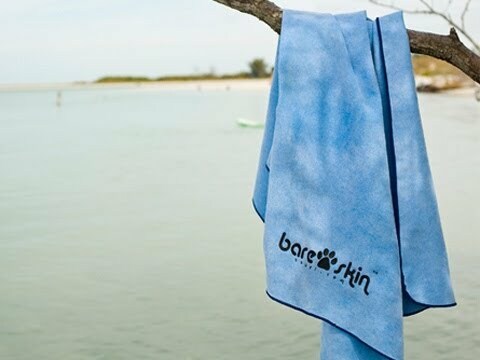 BareSkins are the perfect towels for people on the go. At the beach or on the boat, you won’t be weighted down by soggy, sandy conventional beach towels. They’re so effective you can even have family members share one BareSkin towel to save space in your bag. Use a BareSkin at the gym, and even if you forget it in your bag, it'll be dry and odor-free for the next time. It’s the future of towel technology—soft, super-absorbent, fast-drying, anti-microbial, and space-age compact.